Should Sparky go Facebook? Aye or nay – have your say! A considerable number of people have approached us during the last year and asked where they can find us on Facebook / if we are on Facebook. You can’t find Good Boy, Sparky! on Facebook because we don’t have one. Opinions on Facebook differ greatly here in the doghouse; it’s a classic Marmite-situation (hate it or love it). … that Facebook is the best invention since canned spaghetti, that it’s a great tool to connect people and promote the website. That aside, everybody is on Facebook. Frank’s a tech-savvy dog, so he’s convinced he could navigate the dangerous waters of FB without any dangers for involved dogs. … canned spaghetti are pointless, and the same goes for Facebook. Sparky has major privacy, security and copyright concerns, and doesn’t really see the point of connecting with people on FB when they can just click a link and read the same content they’d get on Facebook here on this blog or the website. Of course we could argue for a couple of months longer, but as this is the People’s Republic of Sparky, we thought we’ll ask for your opinion. Facebook aye or nay, folks? Have your say. The poll is up for a week, so please, vote away. Once it’s finished, we’ll have a look at the numbers and then make a decision. "Yes! Yes! Yes!" "No! No! No!" "Yes! Yes! Yes!" "No! No! No!" "Yes!" "No!" "Grrr!" "Snarl!" 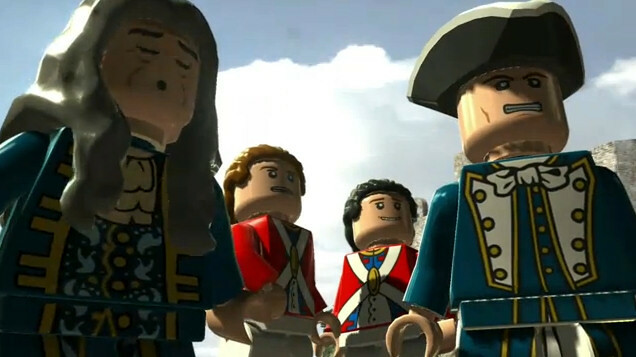 The only “games” I have on my computer are the ones that are pre-installed, but the new trailer for the Lego video game of “Pirates of the Caribbean” looks like great fun. I might give into temptation and order it; my inner 12 year old would greatly approve! Quite a dashing gentleman – brickleman? – if I may say so! Jack Davenport was born on 1st March, 1973. This means he’s 5 1/2 dog years old today – congratulations!